We have a wonderful group of parents that work full time, part time or stay at home who have taken on additional roles on the PTA Board or as Chair Members. I am very proud to work with these parents who already have busy lives and want to give more so that our children can enjoy enrichment programs. Updates will be sent out on a monthly basis to give recaps of past events and news of upcoming events planned by these amazing parents. Have a wonderful school year!!! Our Family Event Chairs, Mark and Stefanie Nix did an awesome job on their first event of the year. Planning started with creating a flyer to send home with our first day of school envelopes, then coordinating the setup, handing out of frozen treats and booking an extraordinary magician, Arty Loon, who got the audience captivated and laughing all through the act. Thank you to Mark and Stefanie who did an amazing job and to Elsa Harrison for the tasty frozen treats, Dolores Wirth and Julissa Salamanca for manning the PTA information tables, Ms. Estling for her ongoing support and the other volunteers that I did not name. Dolores Wirth and Rochelle Ferranto, our Teacher/Staff Appreciation Chairs, did an extraordinary job of spoiling our teachers with a super tasty and healthy back to school luncheon. We owe so much to our teachers and staff who work so hard to educate and support our children. Many times, our teachers continue their jobs at home in preparation for the next school day. This year, our chairs will plan to spoil them more by planning monthly treats for them to enjoy. Thank you to our duo Dolores and Rochelle for a super tasty job well done and to their assistants: Elsa and Nick Harrison, Sonia Maceranka, Keira Meirkovsky, Diedre Lisando and Cameron Solis. Corner Bakery was the venue for our parent social. Thank you to our super Dine Out Chair, Sonia Maceranka, who is also the PTA Auditor, for planning this get together for us. I was pleased to see that some of our alumni parents attended the social as well. I took that opportunity to find out more about life at Los Alisos. It was also a great time to catch up with friends we had not seen all summer to see what fantastic things they did. Corner Bakery gave Gates PTA a check for 15% of sales in the amount of $44.22. Our Membership Chair, Bernice Chen, did an awesome job running the membership drive themed "Be a Hero and Support our Kids" along with her family members, Rolando, Paul and Isabella who helped her make posters and put the perk bags together. 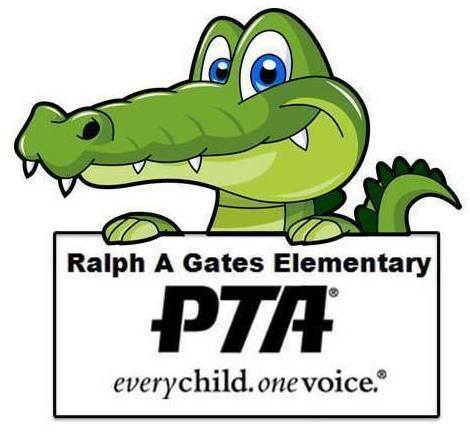 As of September 30, Gates PTA has approximately 478 PTA members which is 35 more than last year. Thank you to Bernice and her many assistants who helped assemble the membership packets on 8/31, sort through membership forms, count money and put perk bags together from 9/6 to 9/16: Victoria Esquivel, Katie Ryan, Natalie Paffrath, Dolores Wirth, Keira Merkovsky, Nancy Norris, Indhira Gagnon, Monica Diaz, Olivia Renella, Brenda Thompson, Karen Boepple, Jannet Castellano, Robin Schnell, Cindy Allen, Sarah Gustin and Elsa Harrison. It's not too late, memberships are accepted until the last day of school. Forms are available in the front office in the rotating file. Reminder: Deadline to turn in art was Friday, October 7 by 3pm at the front office. Our children completed their 1st Art Master lesson with the focus on Ancient Americas. Students gained an understanding of ancient cultural iconography and used special plastic color sticks to create their own icons emphasizing the colors and style of the Ancient Americas. Thank you to Katie Ryan, Art Master Chair and Bobbie Cunningham, Art Master Assistant Chair who are coordinating this Program for our Gators and thank you to the parents that helped during these 1 hour lessons. Huge thanks to the parents who attended the meeting to vote on the calendar, state grant applications, the budget, ratification of checks, release of funds, contracts and the audit. Thank you to Dolores Wirth who helped setup the tables and the snacks; Thank you to Ms. Olomi and Ms. Hernandez for providing childcare during the meeting; Thank you to Bobbie Cunningham for taking minutes at the Board and General meetings and to all of the Board and Chair members who presented at the meeting. Chipotle gave the Gates PTA a check for $577 equivalent to 50% of total sales for the evening. Thanks so much to the parents who participated in this dine out fundraiser and to Sonia Maceranka for booking this for us. Our teachers appreciate all of the parents who volunteer to help in the classrooms. Two very informative training sessions were conducted by our Room Representative Chair, Pamela Mammen. She went over school policies and distributed a Room Parent Handbook. If you missed the meeting, please be sure to connect with Pamela to make sure you are aware of the school policies. She can be reached at roomrepresentative.gatespta@gmail.com. The catalog fundraiser had an amazing start with the Pep Rally on 9/29. The kids were pumped up about the prizes for selling 1 item all the way to 100 items. There are accumulative daily drawings for coupons turned in for 1, 2, 4, or 7 items sold. In addition, the classroom that turns in the most coupons for the day wins OLLIE the Owl for the day plus a playground ball for the class. We have 1,034 students in the school. If each child sold 1 item or turned in 1 donation of $10 that would be a total of $10,340 and if each child sold 2 items or turned in 2 donations of $10 each that would be $20,680, etc.. The target is $38,000.00. Thank you to Andrea Merchant, Catalog Chair, for running this huge fundraiser. She can be reached at catalog.gatespta@gmail.com. - Donations of $10 is equivalent to 1 item sold. Use code #900 on the paper order form for donations. 100% of donations go to Gates. Donations are not accepted on the online store. - Turn in all money in the envelope along with the white and yellow order forms on Monday, October 17. Keep the remaining copy for your records. Thanks to Mark and Stefanie Nix, we had a "Dinomite" time at the movie night on September 30. Children and parents alike enjoyed digging for fossils, viewing assorted reptiles eating a taco dinner with assorted movie time snacks and watching "The Good Dinosaur". Thank you to all the families who joined in on the fun and all the volunteers who helped with setup, working food service as servers and cashiers and cleanup: Joe Ryan, Maria Mujica, Maria Herrera, Valia Oliva, Carey and Frank Yannarella, Emerene and Brianna Adams, Kayla Camargo, Sesilia Arce, Michelle Sanchez, Andrea Merchant, James and Brenda Thompson and our membership chair Bernice Chen for checking in members and selling movie tickets, our Fundraising Chair, Dolores Wirth for selling Spirit Wear items. What a truly wonderful evening!!! Stay tuned for more Family Events. Mark and Stefanie can be reached at familyevents.gatespta@gmail.com. - Donations of $10 is equivalent to 1 item sold. Use code #900 on the paper order form for donations. 100% of donations go to Gates. Donations not accepted on the online store. - Turn in all money in the envelope along with the white and yellow order forms on Monday, October 17. Keep the other copy for your records. Turn in Deadline was October 7 to front office. Art work will go through judging process. Chairs: Erin Foellmi and Acecy Buensuceco can be reached at reflections.gatespta@gmail.com. Art lesson #2 will focus on Native American Art. Assembly scheduled on October 17, Monday, and art classes on October 24, 25, 27 and 28. Volunteer request to go out this week. Wristband sales will be on Tuesday, October 11 and Thursday, October 13 before and after school. Wristbands are $15 each and will be given at time of purchase. Wristbands are good for Tuesday, October 18 from 3:30 to 8:30 pm. Thank you to those who signed up to help with wristband sales. Gates Elementary needs volunteers on Thursday, October 20 to help keep the children in lines before and after the Vision and Eye Tests. Click here to volunteer. Art lesson #3 will focus on the art of Joseph Raffael. Assembly scheduled on November 7, Monday, and art classes on November 14, 15, 17 and 18. Come to find out what your PTA is planning in the coming months. Come and learn about the Nominating Committee.